The diffuser and the filters can be used on the flash heads of the T28 Macro Twin Flash 1 and the T28 Macro Single Flash 1 – the statement in the instruction leaflet that they can only be used with the T32 is out of date. To fit a diffuser or a filter over the front of the flash head, slide it in from one side, with the bevelled edges behind the metal lips at the top and bottom of the head, until it clicks into place. To remove a filter, slide it out to one side. The diffuser softens the light and reduces the output by 1 stop. The ND4 neutral density filter reduces the output by 2 stops. The ND8 neutral density filter reduces the output by 3 stops. The filters are supplied in a folding plastic case that has 4 compartments on each side (and so can hold 8 filters) plus a central holder for the instruction leaflet. 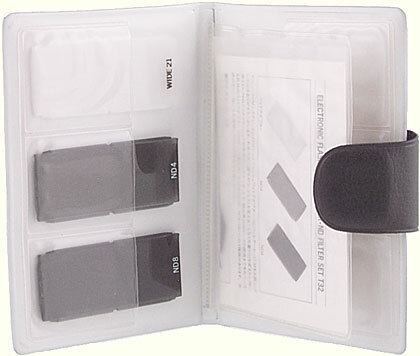 This set of 3 filters (a wide-angle diffuser and two neutral density filters) are designed specially for use with the Electronic Flash T32. The Wide Adapter increases the T32’s angle of coverage to the picture area of a 21mm super wide-angle lens, and also provides a softer, more natural illumination. The ND filter reduces the quantity of flash light without affecting color quality. (1) Turn the T32’s diffuser window fully upward (90°). (3) until it stops with a click. These units cannot be used with any electronic flash other than the T32. When attaching to the T32, hold the filter firmly in place; otherwise it will slip off when the diffuser window is turned to 0° position. Clean the filter with a soft, dry cloth. Do not use organic solvents (alcohol, thinner, etc.). For TTL AUTO working range (with OM-2 or OM-2N), see below.